Yesterday boats and their crews assembled in the port of Ramsgate for what was to be the start of the third and final cruise of the MBM Cruising Club 2010 season. However, it seems the weather gods and mechanical gremlins were out to prevent lead boat Blue Fin from reaching Ramsgate on time. After having to turn back due to poor weather conditions on Friday, a second attempt to reach Selsey Bill and beyond on Saturday also ended in disappointment. 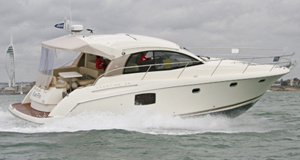 The Jeanneau Prestige 38S suffered electronic problems and had to limp back into Portsmouth on one engine once again. With a 100-mile passage ahead of them, the team decided to postpone the planned briefing until the following night. Later that afternoon, much to the relief of the MBM team, Blue Fin was up and running again, surfing into Brighton by tea-time. Third time lucky, Blue Fin and the MBM crew’s second support boat, Time Flies, reached Ramsgate by midday on Sunday and were greeted by cheers from the waiting crews. With a mixture of new faces and old, everyone mingled as they gathered for the inaugural (and much anticipated) briefing at the Royal Temple Yacht Club. Cruise leader Neale Byart addressed the 19-boat fleet, conveying his thoughts and plans for tomorrow’s passage to Nieuwpoort (Belgium). Time Flies will be the first boat to depart Ramsgate at 7am to assess the conditions with MBM’s Claire and Cruising Club staffer Keith aboard. The call will be made by 7.30am, with the first boats departing at 8am. A handful of the boats will be making their first Channel crossings tomorrow, including B Natural, Crescendo II, Tidesend and Chardonnay.